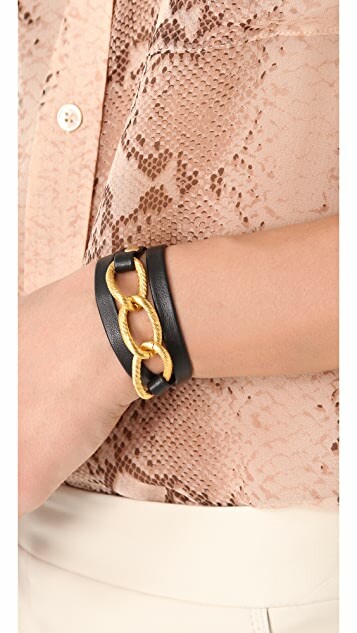 This leather wrap bracelet features textured gold-plated links and a ring-and-toggle clasp. * 19.5" (49.5 cm) long. Very dissapointed, this bracelet didn't even come close to fitting my wrist...let me note I have never had that problem before, I am a size 6. Also, it wasn't worth it to me to send it back, since it was going to cost me approx $30.... that's ridiculous?! So I guess i'll cut it, and sew it so it actually fits me....sad that i have to do that. 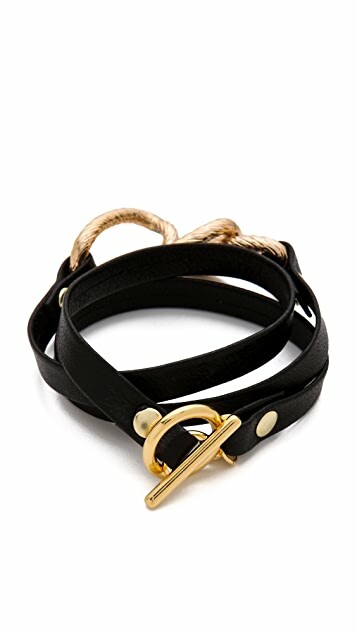 overall, the product is nicely designed with enough leather wrapped around the wrist to give the rebel rock look, yet the rose gold metal chains soften the overall hardness by adding an element of femininity to it. I have a small wrist and the bracelet wraps itself around nicely. leather quality is soft and good, however the metal chains could be made of a better quality/harder metal. This bracelet is great quality but I am small framed and it barely fit my wrist. If you have a larger than 7 inch wrist it might not be a good choice for you. Very poor quality but a fun piece. I had received this bracelet and was disappointed to see that much of the gold paint from the chain was already chipped off. I was even more bummed by how poor the quality of the chain was: it was very cheaply made, very light, almost like plastic. The (faux?) leather straps were quite soft and nice, though. It was a little large around my wrist though I do have quite a thin wrist. Because of the versatility of the color--black & gold--this piece makes a great/fun bracelet to stack with other bracelets, which is why I had bought it in the first place. But it would probably not look too complimenting on its own. Love this wrap bracelet with vintage inspired metal rings in light gold and yellow gold studs clasps and accents. The links feel really cheap and clank together to make an annoying sound. The quality could really be better. I love this bracelet. It's super chic. I get compliments on it each time i wear it! Very pretty and simple in person although I found it too tight to wear and will be returning the item. I have an average size wrist and found it odd it was too small.